We’ve always known that Sudbury is a special hub of creativity, so we’re excited to help unveil these new scripts as part of PlaySmelter—the first annual English reading series of its kind in Sudbury. It’s a grassroots, locally-grown gig and we love that about it. 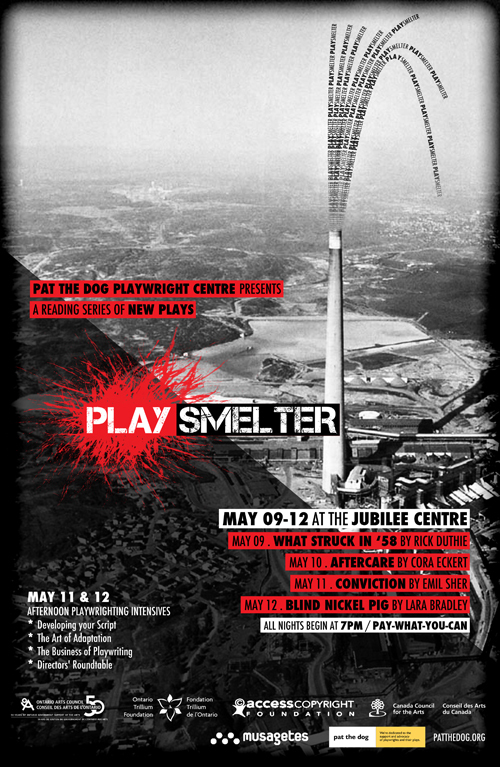 From May 9 to 12, 2013, four new plays will be given their first readings in front of a live audience as part of PlaySmelter—Award-winning playwright, Emil Sher, will join Sudbury artists Rick Duthie, Cora Eckert and Lara Bradley in this new initiative, produced by Pat the Dog Theatre Creation. After more than a year of working alongside these writers, we are inviting the audience in to come and play with us during this week of performances and writing intensives. Thursday, May 9: What Struck in ’58 by Rick Duthie. A sweeping epic about the first Inco Strike, Duthie’s play is a love letter to a forgotten past. Saturday, May 11: Conviction by Emil Sher. A stirring documentary-drama about the Charles Smith pathology cases that shook communities such as Sudbury and the Sault. Sunday, May 12: Blind Nickel Pig by Lara Bradley. A rollicking piece, inspired by burlesque and vaudeville, about the early days of prohibition-era Sudbury. Everything happens at the Jubilee Centre, our newly-converted artistic space at 195 Applegrove Street. 7pm start times. Admission to each evening is Pay-What-You-Can (suggested minimum $10). Each piece will be followed by a discussion where the audience is invited to become part of this development process. We’d love for you to come out, dig in, and share your thoughts with us. We’re also offering intensives on May 11 and May 12 for budding writers and those really wanting an inside glance into the world of play development. These animated discussions with local and national artists will revolve around the craft and business of writing for the stage. You’ve written that first draft. Now what? Join PTD Artistic Director Lisa O’Connell and PTD dramaturge Carina Gaspar as they lead you through how to make the most of working with a playwright development centre. Adapting literature for the stage is no easy feat. Award-winning playwright Emil Sher has written stage plays for adults and children, screenplays, non-fiction and children’s fiction. Among his most produced plays are Bluenose, Beneath the Banyan Tree, Mourning Dove and Hana’s Suitcase, and the hit-radio drama Afghanada for CBC radio. Join Emil as he takes us through his process for adapting material from another medium to the stage. Getting produced. Working with the Playwrights Guild of Canada. Festivals and producing companies. Join STC Playwright-in-residence Matthew Heiti and PTD’s Lisa O’Connell in a lively, honest conversation about the real-politick of being a professional playwright today. A roundtable discussion with professional directors on working with playwrights and their scripts, what a director looks for in a play, and taking words from the page and giving them new life on the stage. These rare and intimate discussions are being offered free of charge. Space in these intensives is limited, so please contact Matthew Heiti at matthew@patthedog.org or at 705.207.7849 to confirm your attendance. Come on out and play with us. This project is made possible in part by the generous support of the Ontario Trillium Foundation and the Access Copyright Foundation. Big, big thank you there.